Earlier this month, the Girls Varsity Basketball team had the opportunity to meet with a group of Olympic champions when four members of the San Diego Stars dropped by the team's afternoon practice. 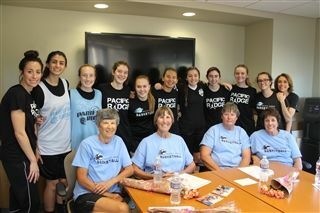 The Stars, Women's Basketball Champions of the 2003 National Senior Olympics, compete in a local, Women's Over-50 league that is part of the Senior Women's Basketball Association. Many of the San Diego Stars players attended high school during a time when opportunities for female athletes were limited or non-existent. Through the SWBA, they are able to become the athletes they once dreamed of. The Firebirds loved spending time with the Stars, asking for advice, swapping stories, and shooting hoops.